Experience Hendrix L.L.C. and Legacy Recordings, the catalog division of Sony Music Entertainment, are releasing Machine Gun: The Fillmore East First Show 12/31/69, fully documenting the debut performance of Jimi Hendrix's short-lived but eternally influential Band of Gypsys on September 30. The group played four historic concerts at the Fillmore East in New York City - two on New Year's Eve 1969, and two on New Year's Day 1970. Never before has the first of these sets been available in its entirety. The vast majority of the performances have never seen the light of day in any configuration. 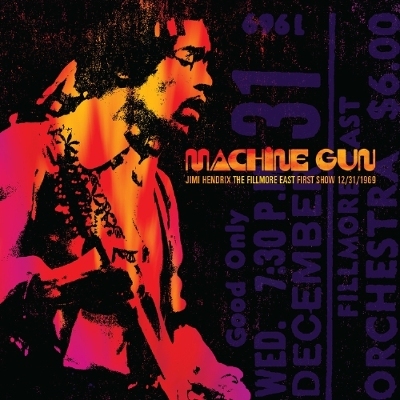 Machine Gun: The Fillmore East First Show 12/31/69 marks the first ever Jimi Hendrix SACD and high resolution digital release. Additionally, Experience Hendrix is also releasing People, Hell & Angels on the same day. People, Hell & Angels, a collection of previously unreleased studio recordings, peaked at #2 on Billboard's Top 200 Album chart in March 2013. The album features studio versions of many of the songs featured on Machine Gun: The Fillmore East First Show 12/31/69. Over the course of four extraordinary years, Jimi Hendrix placed his indelible stamp upon popular music with breathtaking velocity. Measured alongside his triumphs at Monterey Pop and Woodstock, Hendrix's legendary Fillmore East concerts illustrated a critical turning point in a radiant career which boasted of indefinite possibilities. The revolutionary impact Jimi Hendrix, Billy Cox, and Buddy Miles had upon the boundaries and definitions of rock, R&B, and funk can be traced to four concerts over the course of two evenings on New Year's Eve and New Year's Day. These performances were first celebrated by Band Of Gypsys, which featured six songs from the two January 1, 1970 concerts including "Machine Gun," the album's dramatic centerpiece. Issued in April 1970, Band Of Gypsys challenged and surprised the guitarist's wide following with its extended arrangements and vibrant mix of rock and soul. Nonetheless, the album proved to be a runaway commercial success and sadly, with his death in London in September 1970, would become the last album Jimi Hendrix personally authorized for release. Machine Gun: The Fillmore East First Show 12/31/69 documents the first of the group's four legendary Fillmore East concerts. This set presents an assortment of fresh, exciting new songs such as "Earth Blues," "Ezy Ryder," "Stepping Stone," "Burning Desire," and "Machine Gun"--none of which had ever before been issued on disc. Moreover, nearly all of the group's material had never been performed before an audience. "We decided that we couldn't do any songs that had already been released," explains Billy Cox. "We wanted to give them something different. So we went at the project in a joyous, creative posture and ultimately developed the repertoire of the Band of Gypsys." While promoter Bill Graham had advertised the concerts as 'Jimi Hendrix: A Band Of Gypsys', few could have anticipated what Hendrix had in store. "We had two shows New Years Eve and two shows New Years Day," remembered Cox. "We didn't know what to expect from the audience and the audience didn't know what to expect from us, but from the time we hit that first note, they were in awe. You had Jimi Hendrix, a drummer who had been with the Electric Flag and Wilson Pickett, and I was the new kid on the block." With the anticipation of the sold out Fillmore audience heightened to fever pitch, Hendrix led his trio through a scintillating, seventy-five minute opening performance. None of the eleven songs presented had yet to grace an Experience album. In the place of signature songs like "Purple Haze" and "All Along The Watchtower" were confident renditions of "Power Of Soul" and "Hear My Train A Comin.'" Jimi generously extended center stage to Buddy Miles, providing a showcase for "Changes" and a charged rendition of the Howard Tate R&B hit "Stop". "We had rehearsed "Changes" and a few others for Buddy," explains Cox. "All of the songs we performed had been rehearsed. We didn't look at it as Buddy's part of the show. We were all there to give. We were all there to help and material went on whether it was written by Jimi or not." Former Rolling Stone senior editor David Fricke, who authored this collection's liner notes, describes "Stop" as being something akin to "a psychedelic power-trio Temptations." Hendrix's scalding version of Elmore James' "Bleeding Heart" is the set's only other cover, underscoring the new band's emphasis on the blues. As the Fillmore audience roared with approval, the Band Of Gypsys left the stage confident that they had validated Jimi's new music before his loyal followers. "After the gigs were finished, Jimi was quite relieved," remembers Cox. "We felt the concerts went well. I might add that in previous gigs with the Experience he had used a fuzz face [tone control pedal] and a Wah-Wah pedal, then at Woodstock he used a fuzz face, Wah-Wah pedal and Uni-Vibe, but at the Fillmore East he used a fuzz face, Wah-Wah pedal, Uni-Vibe and Octavia and it was incredible. In fact you could hear all of it kicking in on 'Machine Gun.' It was incredible. There were people in the audience with their mouths open." "Machine Gun" stands as one of Hendrix's finest and most influential compositions. Hendrix pushed Delta blues into places its pioneers could not have imagined, fusing his extraordinary instrumental skills within his passionate expression of man's inhumanity to his fellow man. "Machine Gun" endures as a classic amongst the already classic-drenched Jimi Hendrix canon. Fricke notes of this version, the first that Hendrix and company had ever played in concert, "..Here it is, after 46 years, another revelation - a stunning essay in pain, rage and determined survival, fully formed in its initial outing."